Zilberman Gallery is happy to announce Zeynep Beler’s project exhibition, Writing Remains, at the gallery’s second floor space in Istanbul, between January 7–February 18, 2017. The departure point for Writing Remains is asemic writing, a wordless, open-ended form of writing that is seemingly a vacuum of meaning. One of the first known examples of this form of writing belongs to two calligraphy masters who lived in China during the Tang Dynasty era—“crazy” Zhang Xu known for his slapdash and contentless calligraphy works and “drunk” monk Huai Su. In later historic periods, this tradition could be traced in different works, including the contentless, text-based works by the Dadaists in the 1920s; Kandinsky’s textual abstractions; Roland Barthes’s contentless paragraphs and letters that he referred to as Contre-écritures. Similarly, Cy Twombly’s blackboard paintings that could be perceived as commentaries on the “legibility” of painting, also serve to underscore the sheer painterliness of text, a curtain of meaning that becomes permeable in relationship to the viewer’s ability to read. In this sense, different examples of asemic writing’s common denominator is not that they contain little information, but rather that they include too much information. Our gaze, accustomed to decoding symbols, enable us to read this as a commentary on the act of writing, calligraphy, or as a mental choreography. Beler’s deep engagement with literature is manifest in her project exhibition, Writing Remains, in that the artist’s process includes thinking about the multitude of meanings in artistic practice, inspired by asemic writing. It is well established that taking notes by hand on a text while reading improves memory retention. Beler, who always uses this method while working, has been producing asemic writing, discovering the difficulty of writing credible “fake” writing. 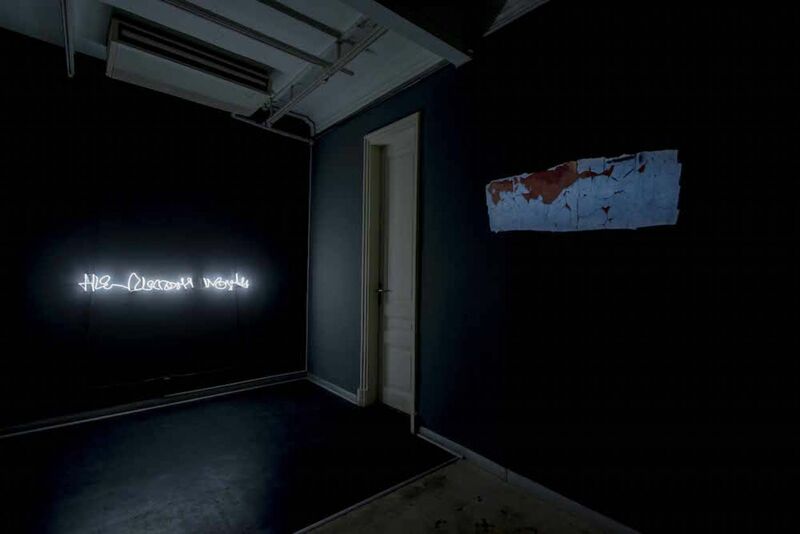 The work included in the exhibition, “sentence”, is the first result of this effort to push the boundaries of credibility. 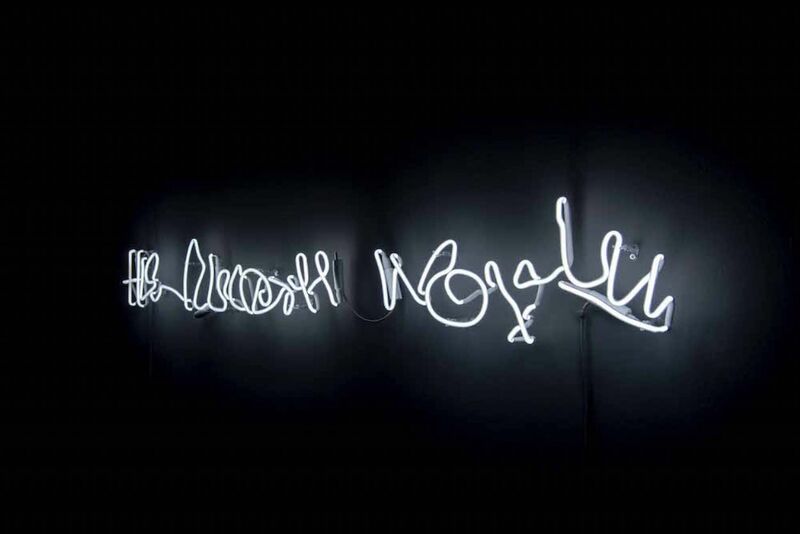 The exhibition also offers a different perspective on alphabet and text as we know them, as these are technologies that are on the verge of disappearing in their familiar forms, replaced by newer technologies. Today, modes of expression that relate to the act of writing have become “fleeting” just like many other things have in the Internet era. 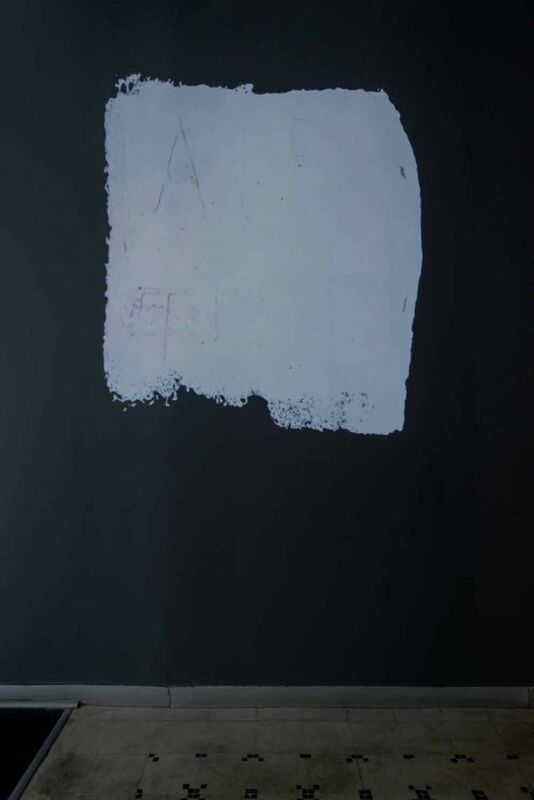 At the same time, the script-shaped stains that one encounters on Istanbul streets present the most primitive technology as a solution to the problematics of expression. In these examples, the authoritarian structure inadvertently generates asemic abstraction. The stain photographs that the artist has been accumulating since the Gezi period emerge as an ironic appreciation of the persistence in constantly re-forming the asemic writing. The exhibition, Writing Remains, invites viewers to decode together what is behind all of the abstractions in the exhibition and what asemic writing could propose. Zeynep Beler (1985, Ankara) graduated from the Graphic Design Department of Bilkent University in 2007 and completed her master’s degree in Photographic Studies at Leiden University in 2010. Between 2010 and 2012, she was a resident artist at the Borusan Art Center. Included in the workshops and residencies she participated in are: Middle Town: Picturing the Unspectacular (in collaboration with GAPO and ISSP) and AiR Turkey-Scandinavia Connections (Tranås, Sweden). She has participated in many exhibitions, including: Young Fresh Different III at CDA Projects, Terror of Reality/ Periferi Kolektif at Depo, Desire at Borusan Contemporary, Habitat at Istanbul Modern and Greetings from Now On: Territories of Commitments at BERLINARTPROJECTS. The artist also works as a literary translator. She lives in Istanbul.